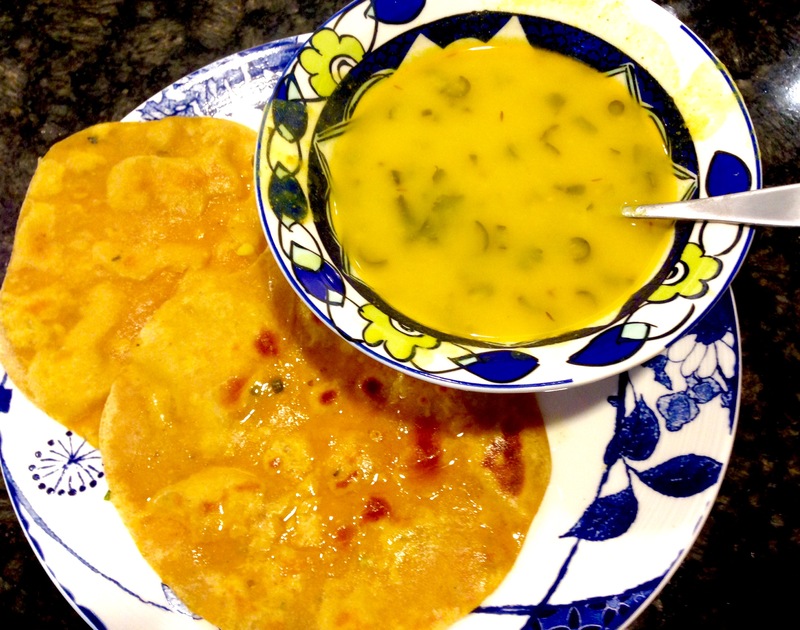 Aloo Kaa Jhol (Indian Potato Soup) – One Half Indian. I spent the last few weeks in Pittsburgh with my family. My sister, JoAnna, got married in my parent’s backyard. The wedding was a lot of work and took lots of hands, but it was beautiful in the end. I was so glad I was able to stay for two full weeks and visit, but I am also glad to be back home. My family definitely eats traditional American meals: no spice, lots of meat, anything served with rice=international, etc. I love all the cheesy, meaty wonders that my mom and dad make, but at the end of two weeks, I missed my own kitchen. 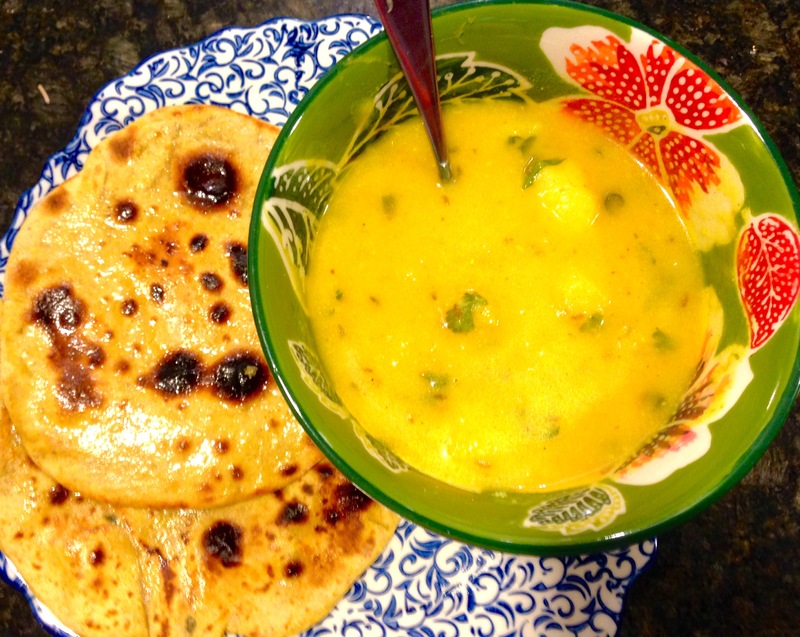 I welcomed myself back home by making chapatis and this aloo kaa jhol, which is basically an Indian potato soup in my opinion. My mother-in-law made this soup for my husband and I while she was staying here, and I instantly fell in love. It’s really similar to how my mom makes potato soup, but the spices are different. I made chapatis to go with my soup, but frozen naan or rice would also be delicious with this. This photo is my family and my sister’s new husband’s family at the wedding. 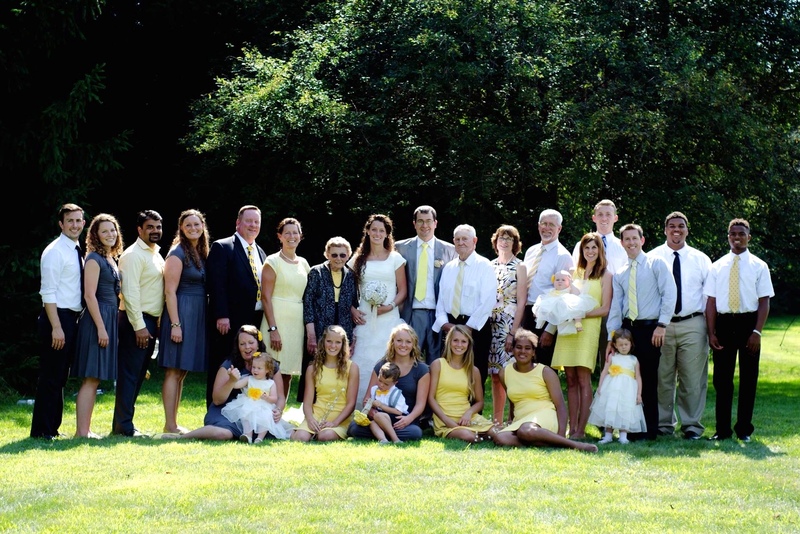 I have 10 brothers and sisters (although one brother was not able to attend), so my family is really monopolizing this photo 🙂 Her colors were yellow, black, and gray- Pittsburgh sports team colors. The whole wedding was Pittsburgh themed. Go Steelers! In a large, heavy bottom pot, heat oil on medium heat. Test to see if the oil is hot enough by dropping in one cumin seed. If the seed fizzes and bubbles soon after falling in, then the oil is hot enough. Add 1 tsp cumin and let fizz for 15 seconds. Add chili pepper and pinch of hing. Stir to combine. Add turmeric, chili powder, coriander powder and stir to combine. TIP: Move somewhat quickly with spices so that they do not burn. You want to get the potatoes and water in within 1 or 2 mins of adding cumin depending on how hot the oil is otherwise your spices may burn. If you feel the oil is too hot, mix the dry spices with a bit of water before adding to the pot. After the spices and pepper have sautéed 1-2 mins, add the potato. Stir to combine with spices. Add the water. The water is the broth in this soup, so add enough water to make the soup as thick or as thin as you like. I added enough water to cover the potatoes by 1 1/2 – 2 inches. If you realize your soup is too thin at the end, you can crush some potatoes to thicken it, and if it is too thick, you can add more water, but you will need to cook it longer if you add more water at the end. Increase the heat to high and bring to a boil. Add salt. (I added about 1 – 2 tsp of salt). Reduce heat to medium. Add the yogurt slowly and whisk the soup constantly while adding to avoid curdling. If the yogurt does curdle, don’t worry. The soup will still taste fine and the yogurt will dissolve as the soup cooks further. Simmer the soup for 20 mins, covered. After simmering, check the consistency of the soup and check for salt. Continue simmering if your soup is too thin or mash some potatoes on the side of the pot with a large spoon to thicken. When finished, garnish the top of the soup with chopped cilantro. Serve with garam masala and a lime wedge.